In partnership with Soliculture and Heliene, Ecohive is offering an innovative agricultural solution with bifacial solar cell technology. 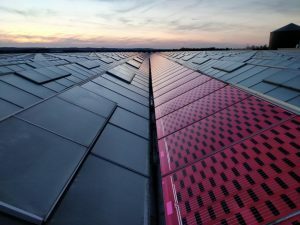 Proven through five years of extensive crop trials at commercial greenhouses, our Greenhouse Integrated Photovoltaic Panels are designed to co-utilize the greenhouse roof for both positive crop growth and clean solar power production. Patented light tuning technology optimizes the sun’s spectrum for maximum photosynthesis. A quantum photoluminescence process is used to convert underutilized green light to enhanced red light with higher photosynthesis efficiency resulting in a spectrum ideal for maximum crop production. 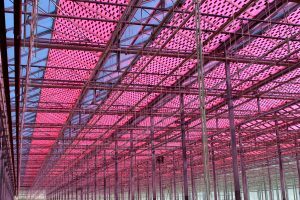 The luminescent solar glass combines efficient greenhouse growing with solar power production. 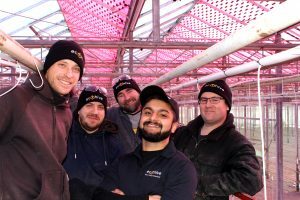 Let your greenhouse pay for itself by harvesting light for both crop production as well as clean energy generation. Glass size is customizable for standard solar mounting over an open field or a frameless option for greenhouse glazing systems. Scaled embedded cells and a light diffusion layer provide uniform illumination of crops with no shading and no crop burning from direct illumination.